Industry Awards... are normally awarded to a person for exceeding a quality standard but in our case, it is about the person (or people), the product (our cars) and the presentation which requires knowledge. 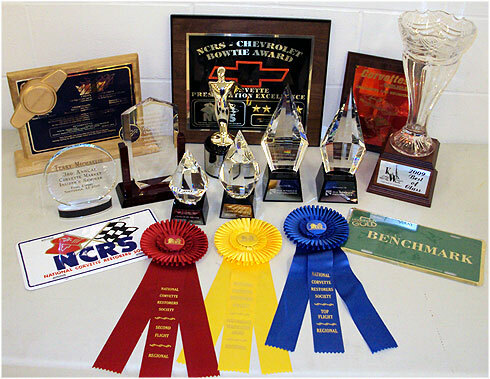 ProTeam's Corvettes achieved 134 show awards and invitationals since 2009. Click to enlarge any photo to view the results of ProTeam's team effort from April 2nd, 2009 to the present with close to 200 industry awards. I doubt there is another person or company that has even come close to our record and in 2013, we added a new award only received by a total of 36 participants, "The NCRS American Heritage Award". In June 2014, Terry Michaelis was inducted into the Bloomington Gold Great Hall honoring the 50 most significant and influential people and organizations.